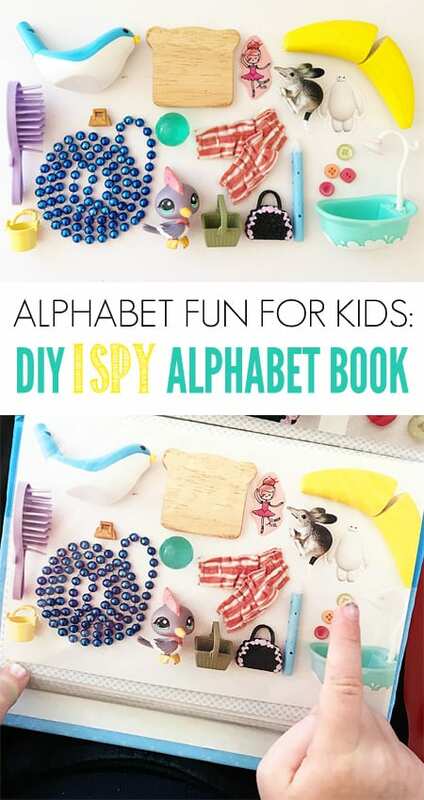 This DIY project is fabulous for engaging children with initial letter sounds. The learning is found not only in the completed book but also in the process of finding toys and other items to include in each collection. In fact, it’s a highly engaging treasure hunt that really gets kids thinking. Both my almost-4 and my 8 year old helped to create the collections for our alphabet themed I Spy book. The completed book being for the almost-4 year old who has recently shown an ever increasing thirst for learning about letters and the sounds they make. A white background works well for the photos. Place your table near a bright window so that your photo is taken in natural light. 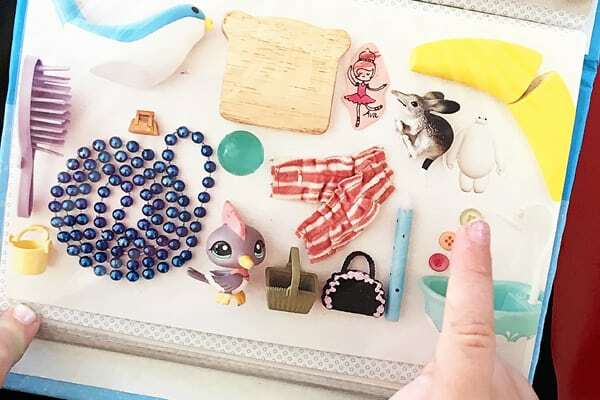 Keep your collections simpler for younger children and make them super busy for big kids. The more visual clutter included in the picture, the harder things will be to find. Don’t try to do the whole alphabet. Start instead with the letters of your child’s name, or those that hold some personal significance or letters your child is learning about. Take photos of your completed collection and of 5-10 of the singular items too. Make simple collages of the single items for pre-readers to find. You can use the free version of picmonkey.com for this. You can also use picmonkey to add text to your clue pages. – What letter do the things on this page start with? – Can you name each item starting with f? – How many flowers can you find? – How many animals start with f? – Can you find something that flies/jumps/tickles? – Can you tell me a story featuring 5 of these f things? Place the printed photo and clue pages into a cheap photo album from the dollar store to create your finished book. 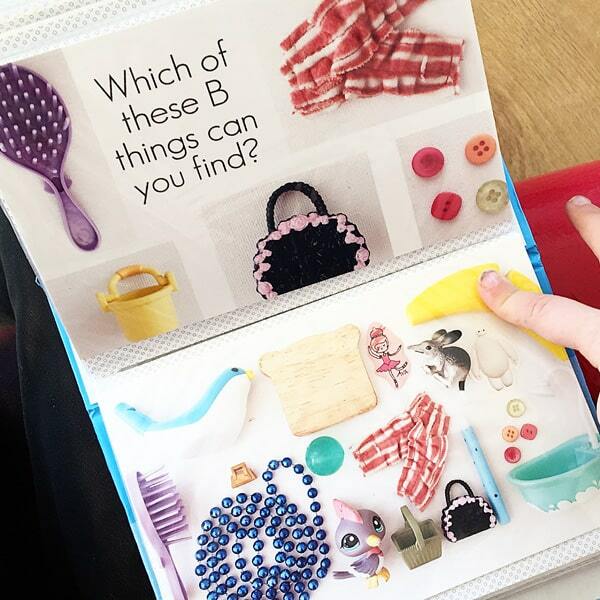 As well as being just plain good fun, your finished I Spy book can also make for a fabulous distraction on car trips or when you’re kept waiting. Enjoy! Eating the Alphabet: Cooking with Kids from A to Z: Cooking is a great multi-sensory learning experience for kids and in this collection you’ll find 26 great recipes – one for each letter of the alphabet! 9 Fun Ways to Sing the Alphabet: Groovy tunes are great for getting kids moving and learning, and we’ve collected together 9 of our favourite alphabet songs on YouTube for you to enjoy. Stamp and Spell Literacy Play: Have fun exploring letter shapes and sounds with playdough and letter stamps. Alphabet Snack Matching Game: It’s a snack and an alphabet game all in one! Christie Burnett is the mum of two, early childhood teacher, author and blogger behind the playful online destination, Childhood 101. The author of Time to Create: Hands On Explorations in Process Art (affiliate link – NurtureStore gets commission for purchases via this link), Christie is passionate about children’s play, creativity and learning. At Childhood 101 she shares playful activity and project ideas for kids – including a very popular printable monthly play calendar, family friendly recipes, ideas for family fun and positive parenting reflections. Previous article: Spring sorting games for numbers, letters and wordsNext article: Make a Mud Alphabet!